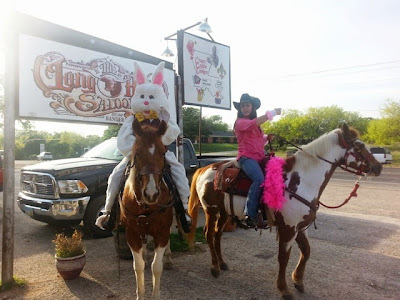 The Singles Dance Rally, sponsored by the SI's RV club, is held in Bandera, TX, every April. It is 10 days of fun and dancing. This is my 7th dance rally and it was just as fun this year as my first year. Here are just a few examples of just how much fun seniors can have. 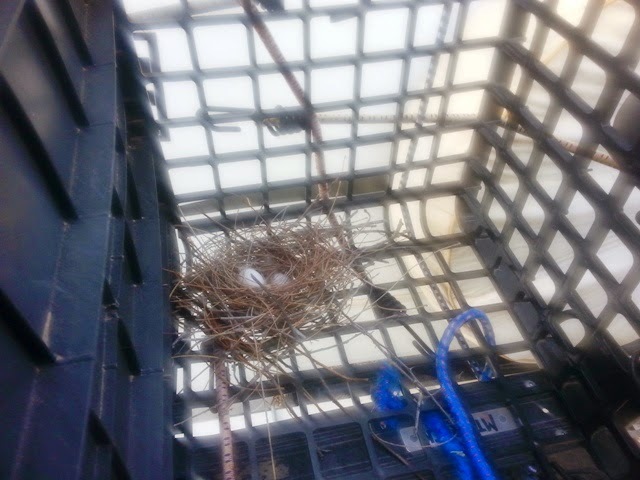 Lyn drove all the way from Tucson with a bird nest in the basket of her bike. I wonder what the mother bird thought when she returned to where her nest had been and it was gone. A number of people arrive several days early. This year a group went out to Toucan Jim's to celebrate Blackbeard's Birthday. Many of the group dressed as pirates. I didn't dress as a pirate, so I got put in the stocks as a scallywag. Below are the owners of Toucan Jim's. Most of the bars, music halls and saloons cater to country music and cowboy ways, so this was a nice change of pace to hear Jimmy Buffet style music all evening. Watching this rooster wander around reminded me of Key West. We always have several theme dances (who says costume parties are only for kids? ), and this year we had Gypsies, Tramps and Thieves for one of our themes. 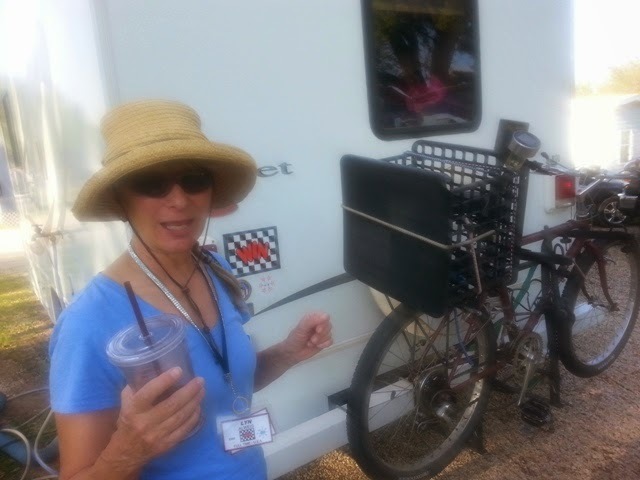 Maryjane's daughter graciously loaned us her Gypsies wagon. Everyone tries to outdo everyone else when designing the costumes. Our other major theme night was a pajama party. We even had a few jam sessions in the afternoon after announcements. This was an impromptu addition, but it was so well received, it is now on the agenda for next year as well. Whenever the Ricky Adams Band plays the 'Irritations' come out to help with the song "Ride, Sally, Ride". We always have one dress up night. Notice, Max is in his Tuxedo again. 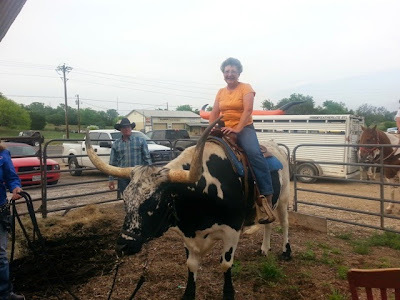 The Longhorn Saloon has its name for a reason, a real longhorn. I even got to ride it this year. And the Easter Bunny arrived on horseback. 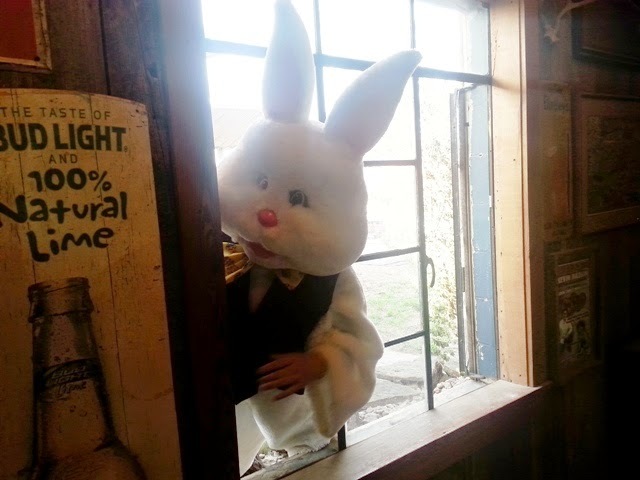 And the Easter Bunny tried to crash the party by coming through the window. We even had someone with a bunny tail and bunny ears dancing. But, there is more than just dancing to do around here. The wildflowers, especially the bluebonnets, were in full bloom. This is up on Bluebonnet Loop north of Fredericksburg, TX. What I really enjoyed was when it was more than just the bluebonnets. The extra color of the red, yellow, white and red flowers were exquisite. One weekend was the reenactment of Mayham on the Medina. 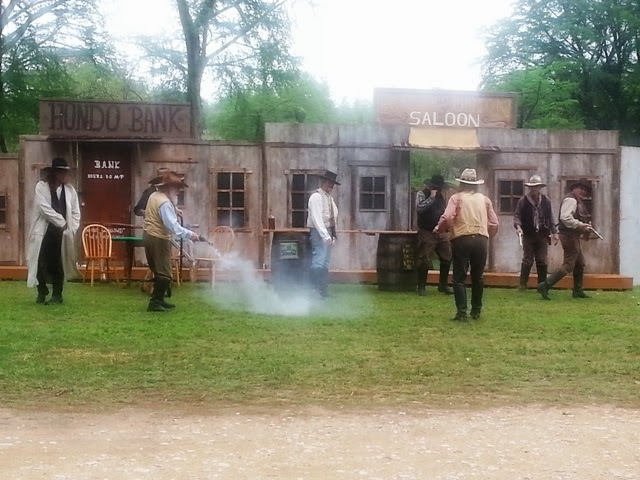 They had gunfights. And they were camped just like in the old days on the frontier. 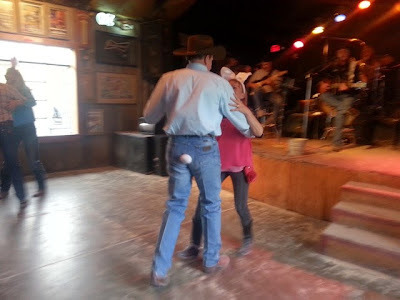 Bandera really was a cowboy town. It was the beginning of one of the cattle drives up north and whenever the cowboys were in town, it did get a little rowdy. I have many more blogs, just check out the previous years archive on the side and look for the dance rally blog found in April.